Lathami Conservation Park is on the drive to the North Coast going toward Stokes Bay. This park is named for the subspecies of Glossy Black Cockatoo of which about 250 remain. The subspecies is found only on Kangaroo Island. This park is dedicated to the careful nurturing and protection of Glossy Black Cockatoos and is slowly increasing their numbers. 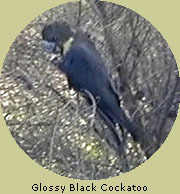 This subspecies of Glossy Black Cockatoo is endangered and now only occurs frequently on Kangaroo Island and some very rare sightings on the Fleurieu Peninsula. Once found as far North as Adelaide, the subspecies has been almost totally confined to Kangaroo Island for the last two decades. Breeding programmes and safe nesting boxes have helped to stabilise and then slowly increase the numbers of birds. The main predator of Glossy Black Cockatoos is the Brush Tail Possum, which has been found to take the single egg or chick from many nest hollows. Much of the Drooping She-oak feeding habitat was cleared and now replanting of these trees ensures a food supply for the birds. The extremely small seeds of the Drooping She-oak are remarkably picked from the cones by the enormous beaks of the Cockatoos. This is their only food source. Glossy Black Cockatoos can be found in American River and Lathami Conservation Park and where nest hollows were in short supply, nesting boxes have been supplied. Conservation of these beautiful birds has been a major programme on Kangaroo Island and it is hoped that in time the bird will be seen often flying with its lazy wing action across the skies of the Island. The Glossy Black Cockatoos future is far from gloomy. A local initiative to save the Cockatoo from extinction is ongoing and so far very successful. This programme guarantees, that the Glossy Black Cockatoo will be seen by generations of visitors to come.